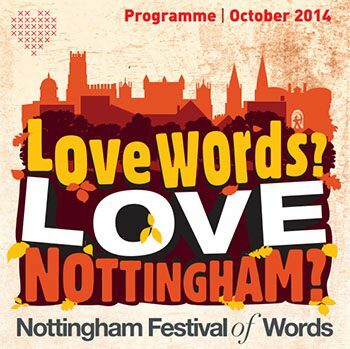 Nottingham Festival of Words takes place from 13th to 19th October 2014, in and around Nottingham. With its central location and excellent transport links, getting to and around Nottingham and the festival venues, couldn’t be easier. Nottingham is just a few miles off the M1 (Junctions 24, 25 & 26) and the A1 (turn off for the A52 towards Nottingham). As well as car parking in the city centre, Park and Ride bus and tram sites are clearly signposted, with frequent bus routes in and out of the city, and a tram stop at Nottingham Trent University’s Newton Building. If coming by train, Nottingham has a tram station directly outside to take you into the city centre – ask for a ticket to the Newton Building or to Market Square for other city venues. If you’re travelling to Nottingham by bus, Broadmarsh Bus Station is a fifteen minute walk from the Newton Building, and Victoria Centre Bus Station is a five minute walk. The closest airport to Nottingham is East Midlands. Located just outside the city, there are regular buses going to and from the city centre. 6 miles west of Nottingham on the A6005. Gannets Bistro, 35 Castlegate, Newark. 3 miles west of Nottingham on the A52 towards Derby. Nottingham Trent University’s Newton Building, Goldsmith Street, Nottingham NG1 4BU. It is a short walk from Nottingham Rail Station. If travelling by tram, alight at Royal Centre or on Goldsmith Street. From the fountain end of Old Market Square, cross the tram lines and continue up the road past the Old Bell. Just off the Old Market Square up a small courtyard alongside Oriel Chambers, opposite The Tourist Information Centre. Just up from St Mary’s Church in the Lace Market. 10-15 min walk from the Old Market Square. Walk up Friar Lane, cross Maid Marion Way and continue to the castle. 5 min walk from The Old Market Square or Royal Centre tram stops. 2 minute walk from The Old Market Square.